TH open mid-June - late October This trail follows its namesake, gently burbling Beaver Creek, for much of its length and eventually tops out near an alpine ridge, where panoramic views and delicate flowers abound. TH open year round This trail follows along a wild upper stretch of the Cache la Poudre River for its entire 10+ mile length, providing great hiking, fishing and backcountry camping. TH open mid-June - late October This trail is a good one if you love alpine wildflowers, as it climbs over a broad alpine pass in its short length. Along the way, you get broad sweeping views in nearly every direction. TH open mid-June - late October The trailhead lies only 600 feet below timberline, so this trail provides quick access to the alpine tundra and its multitude of wildflowers. Beautiful Browns and Timberline Lakes are also highlights of this trail. TH open year round This all-season trail ascends Bulwark Ridge through nearly continuous forest and a few small meadows. The long hike is well worth the effort though, as it provides access to Signal and South Signal Mountains. TH open mid-June - late October This short trail branches off of the Beaver Creek Trail and winds its way through dark subalpine evergreen forest to quaint Comanche Lake, a great place for those hikers and fishermen seeking solitude. 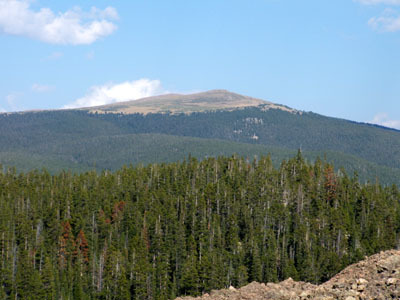 TH open mid-June - late October This hike takes you from the Emmaline Lake Trail, through evergreen forest and on up through the krummholz zone, eventually topping out at the sentinel of the wilderness area, Comanche Peak. Awesome views await you at the top! TH open early July - late October This short trail follows Corral Creek, passing through forest and meadows along the way. It’s also a great jumping off point for those seeking to explore the remote northwestern corner of Rocky Mountain National Park. TH open mid-June - late October This trail starts by passing through the charred remains of the 1994 Hourglass Fire, then enters into dense cool forest where it remains until you reach beautiful swampy Cirque Meadow. Finally it tops out at timberline at picturesque Cirque and Emmaline Lakes. TH open year round This follows its namesake for almost half its length, passing through forest and small meadows. It also climbs over a forested ridge that allows glimpses of the alpine peaks of the Mummy Range to the north. TH open early June - late October This old pioneer road is by far the longest trail in the Comanche Peak Wilderness and is for those who want to see it all: dense quiet forests, gently burbling streams, sweeping panoramic views, sheltered mountain lakes, small grassy meadows, and delicate alpine flowers. TH open mid-June - late October This trail starts at Comanche Reservoir, follows along a splashing creek for a ways, and then climbs through the forest onto the alpine tundra. The views from on top are wonderful. TH open early June - late October This is a pleasant trail that follows along gently cascading Little Beaver Creek for much of its length. Most of the trail resides in cool, shady forest, although there are also a few meadows, including the beautiful Beaver Meadow. TH open mid-June - late October This remote trail allows one to have a variety of alpine views, which you will likely have all to yourself. The two greatest highlights of this trail are the sod cabin, and the magnificent Mirror Lake overlook. TH open mid-June - late October Following a forested ridgeline, this trail climbs above timberline and tops out on a narrow alpine plateau, eventually dropping down to Mummy Pass. A profusion of alpine wildflowers line the trail in the summer. TH open year round This is the only trail in the Comanche Peak Wilderness that provides access to waterfalls: West Creek Falls and Fox Creek Falls. The most appealing aspects of the trail itself are its rugged beauty and peaceful solitude. 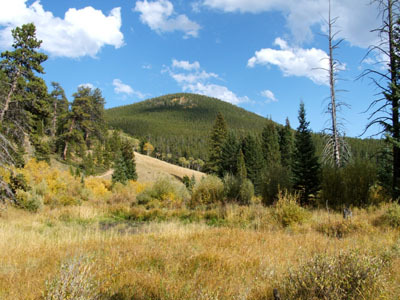 TH open year-round This is a great trail in any season if you like pleasant hikes in the forest, by streams and through small meadows, as it follows the North Fork of the Big Thompson River, providing lush habitat for wildlife and good fishing opportunities. 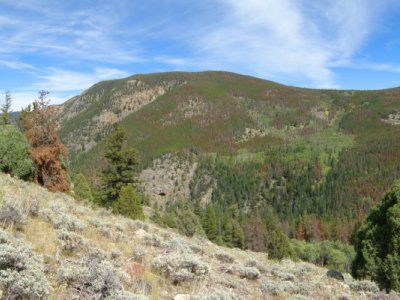 TH open year round The lower portion of this trail follows the pleasant banks of Pennock Creek through shady forest at the bottom of a deep valley, while the upper portion tops out on the alpine tundra on the flank of Signal Mountain. best done in fall This short, but very steep off trail hike takes you to the top of the most-recognized peak in the wilderness area. TH open year round This four-season trail allows you to have a wide range of hikes, depending on what you feel like doing. The actual trail itself passes through mostly evergreen forest, and eventually climbs above timberline, topping out at Stormy Peaks Pass. TH open year round This hike takes you to the site of a B17 bomber crash, which occurred during the Second World War. There are also nice views along the way. TH open mid-June - late October The southern section of this trail provides quick access to the open expanses of the alpine tundra, while the northern section winds through shady forest before reaching the most beautiful meadow of any trail in this guide. Q: What is a "ranked" peak?